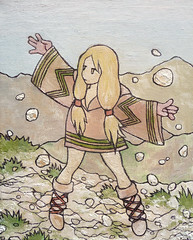 A geomancer is a type of Wizard that specializes in manipulating rocks, ores and the ground below. To make a geomancer, use the character creation rules for wizards in the Player's Handbook with the following options. Intelligence should be your highest ability score, as influences your spell's attack and damage rolls. Wisdom should be your second highest ability, particularly if you have the orb of imposition as your implement. Wisdom is the key ability for the Nature skill, which you should take as it is required for many of your rituals. If you have the staff of defense or staff of grounding, your Constitution is your tertiary ability. In addition to Nature, you should take Dungeoneering. You have an affinity with earth and stone, and are likely to have spent some time spelunking. The most common implements for geomancers are the Staff of Defense, which connects them directly to the earth; or the Orb of Imposition which takes the form of a large crystal or chunk of ore.
A geomancer may optionally take the Staff of Grounding arcane implement mastery. When you wield a staff of grounding, you and any allies adjacent to you have resistance to lightning equal to your constitution modifier. In addition, if you are subject to forced movement you may make a saving throw to avoid being moved. Geomancers may take any wizard spells normally allowed to them, but the following are of particular note. Magic Stones 1 D&D Wiki You scoop up three pebbles, energize them, and hurl them at your foes. Mystical Debris 2 DM 383 You create a small amount of stone and rubble that clogs up the area. Soften Earth 2 D&D Wiki The ground becomes difficult or hindering terrain. Melting Pool 3 DM 382 You create an extradimensional pool of acid beneath your enemies' feat. Acid Mire 5 AP You transform the ground beneath your enemies' feet to hellish slime that eats away at flesh and bone. Summon Iron Cohort 6 AP A dwarf-sized humanoid creature of earth and iron ore appears near you. When you come under attack, it steps in to absorb the force of the blow. Conjure Fortification 6 HotEC A low stone wall rises from the ground, offering cover against attack or passage over an obstacle. Melf's Minute Meteors 9 HotEC Tiny balls of fire wink into existence around your head, awaiting your command to streak toward a foe and detonate. Earthen Grasp 9 HotEC A great fist rises from the ground to smash your enemies flat. Summon Hammerfist Crusher 10 AP A hulking creature of rock appears before you. It strikes too slowly to possibly hit a living creature, bit its mighty fists turn walls and doors into rubble. Dig 10 HotEC You cause earth and stone to pull apart, creating a deep pit or a shortcut to a different location. Earth Brute 13 AP The ground creaks and moans, and a creature of rock and earth emerges to smash your foes. Stonewrack 15 AP You clench your fists as you call on the earth to obey you. The ground buckles amid your foes, creating a mass of jagged rocks. Summon Stormstone Fury 15 DM 385 A hulking elemental of stone and living thunder answers your summons with a sound akin to cracking rock and rumbling thunder. Stoneskin 16 PH You sprinkle a tiny pinch of diamond dust over the subject, and his skin turns gray and hard as granite. Shard of the Endless Avalanche 17 AP You conjure a massive boulder from the Elemental Chaos that smashes through your enemies' ranks, then shatters and dissipates. Entombing Earth 19 DM 372 A maw of moaning grave dirt appears around your foe and slams shut with echoing finality. Landslide 19 HotEC Stones, pebbles, and debris tumble away from you in a tremendous flood of earth that sweeps through everything in its path. Living Iron 22 HotEC As the spell takes effect, the target's body screeches as its flesh darkens to polished black iron. Summon Earthwind Ravager 25 DM 385 Punishing winds blast outward as a churning creature of stone and whipping air bursts into being. Orb of Doom 27 DM 380 You create a replica of your orb around your foes, trapping them in a crystalline prison. Meteor Swarm 29 PH Fiery orbs rain down from above, shrieking loudly as they fall. They smash into your foes, obliterating them in a storm of fire and scorching the ground. Summon Living Mountain 29 AP You oart the planar walls to call a sentient mass of living rock from the Elemental Chaos. It emerges to crush your foes beneath its granite feet. Crack the World 29 HotEC The ground shudders and pulls apart to form a deep chasm into which your enemies fall. The following rituals are the most commonly taken by geomancers.